Just a reminder that I’m this week giving away my novella Like Clocking Fuckwork (which you can find on Amazon here) as a free ebook. If you want a copy, send me an email at cwviderkull (at) gmail (dot) com, tell me which format you would like it in and I’ll send it to you. Oh, and have an absolutely wonderful weekend everyone. Yes. 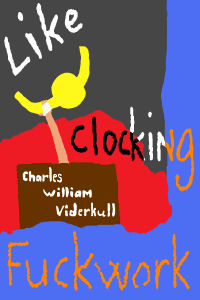 This weekend my novella Like Clocking Fuckwork is free to download as an ebook from Smashwords. Follow this link to Smashwords and enter the Coupon Code ND34K for a free purchase.